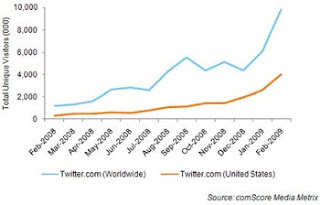 Twitter use is exploding, according to a report today from comScore. As the chart below indicates, worldwide visitors to Twitter approached 10 million in February, up an impressive 700+% from the same period a year ago. 25-54 year olds are leading this trend. In particular, 45-54 year olds are 36 percent more likely than average to visit Twitter, making them the highest indexing age group, followed by 25-34 year olds, who are 30 percent more likely. Lawyers looking for new business should take a look at how clients, co-workers, and competitors are communicating online. You can find me on Twitter at @RainmakingLady.